TC-Helicon have improved upon their one-button MP-75 microphone with the addition of... three new buttons. This expanded control gives vocalists the ability to call upon far more TC-Helicon effects processing power right from the palm of their hand than ever before. Vocalists can take more control over their TC-Helicon equipment while unshackled from the hardware, thanks to the options allowed by the new mic. The buttons of the MP-76 can be assigned to toggle effects and presets, controlling loops and more from anywhere on stage. As for the capsule quality, the MP-76 features the same Lismer capsule as the MP-75. The super-cardioid polar response should ensure that the microphone picks up less unwanted spill from the sides. 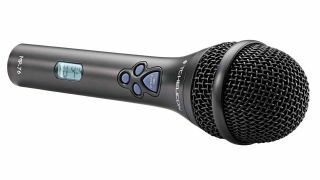 It connects via an XLR cable, which TC-Helicon are keen to label as an advantage. The MP-76 will be available next month, and should set you back £119, $179 or €149, depending on what currency you think is the coolest. Find out more at the TC-Helicon website.